Oh yeah, the eye surgery... next Thursday morning I am going to have some retinal repair work done on my right eye. Apparently it is not a big deal, and I will be awake during the surgery, but of course my eye will be frozen. Afterward, I have to spend 3 days, face down! so we are moving into a charming inn and I will have the support of some special appartus to help me achieve the desired physical positioning, during that time. Not looking forward to it, but not freaking out either. It has to be done. The surgeon told me that I can resume normal activities within a week, including running. This is so much better than the 8 weeks I had to lay off last Spring. I have no reason to believe he isn't right. So, by the end of October, I should be able to be running and doing other exercise again. And today I am looking forward to that time and thinking about what that will entail.... running, walking, upper body work with my dumbbells, some lower body work such as lunges and squats, and probably Pilates. At least I can do those things easily while we are on the boat.... once we move into the house again, I can add other activities to that list... but I will think about that another day. This afternoon The Captain shared his Cashew Cookie LARABAR with me. We cut it in half and had a few salted cashews and a cup of green tea alongside. Mmmm. No wonder this one is is his favorite... chewy and sweet and nutty! Calories 230; Protein 6g; Carbohydrate 23g; Fat 13g; Fibre 4g. If you would like to try one for yourself, enter my giveaway HERE. LARABAR provided this bar free of charge but the opinion is 100% my own. If you leave me a comment on this post, telling me what your favorite winter workouts are, I will give you an extra entry into my giveaway. I hope your eye surgery goes well! Three days face down! You will really appreciate it when you get to get out of that position! Yum! I love the cashew cookie flavour too! Too bad about the eye surgery, even though it's not a big deal. It's still surgery! I'm sure you will recover quickly and get back to your routine! I hope your eye surgery goes well and you recover quickly! That eye surgery doesn't sounds ideal, but at least you'll be back to running and exercise in a week. 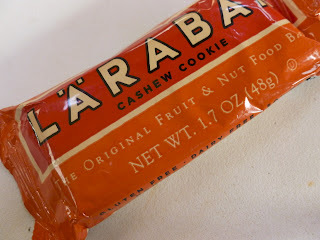 I think cashew cookie is one of the few larabars I actually haven't tried before...but I'm sure I would love that flavor too! I love focusing on strength training in the winter, using resistance bands inside is great when you don't want to head out into the cold! Hmm....I really don't know yet. This is pretty much my first winter that I will be doing my workouts. I imagine anything that'll keep me warm! will be thinking of you friend as you go through this surgery and post-surgery recovery! thanks for the great larabar reviews! my favorite winter workouts are Circuit Training DVDs! sending positive thoughts for next week! That face-down thing sounds tough, but you will be better for it! I have only tried a mini larabar cashew cookie once, but I did thoroughly enjoy it! My favorite winter activity would have to be, treadmill intervals (am I weird?) and hot yoga! I love how it is an hour and 15 minutes of hot sweaty mess before I have to brave the cold again! What are you going to do while lying face down? Can you read? Can you set up a TV? Or maybe you should go to the library and get some audiobooks! Good luck with your recovery! 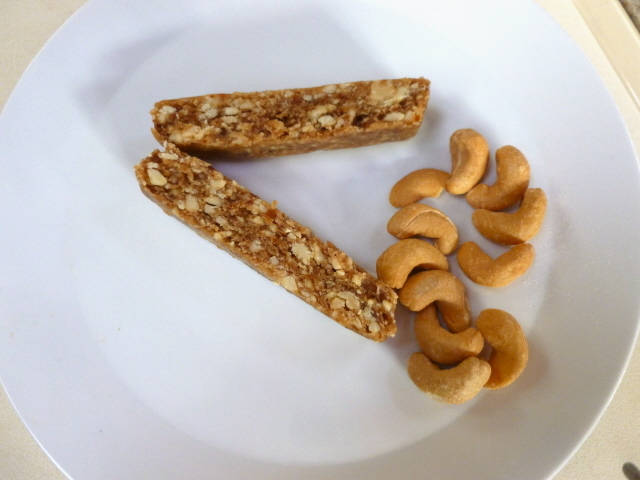 I like that cashew larabar! That and the apple one are my faves! During winter I usually run on the treadmill!